I adore the way Hemingway wrote of Paris. Reading him, more than anything else, attracted me to the city. And as I search through The Sun Also Rises, trying to select a passage that conveys the city, I realize how little Hemingway actually told of Paris. But if you've been there, his focus and simple descriptions take you back completely. It is with a similar vision that I photograph the city, looking at the textures, forms, and spaces to convey what Paris feels like and to reveal how much it is changing. Photographing thoroughfares and monuments like the Champs-Elysses or the Eiffel Tower can serve to symbolize Paris, but these images do not describe the city. Pictures depicting the character of the large boulevards, small back streets, interior courtyards, and winding wooden staircases--ingredients of every arrondissement--do. And these elements begin to describe the city's most engaging and descriptive feature: the hierarchy of space. Paris is an arterial network of boulevards, radiating from étoiles that resolve into local streets and interior courts around which much of the town has been built. This order sets up a diversity of visual and spatial contrasts that makes walking the city a definitively Parisian experience. But this network is a relatively recent creation, a product of the mid-nineteenth century, when Napoleon III hired Baron Géorges-EugeIIne Haussmann to replan the city. Between 1853 and 1870, Haussmann changed more of Paris more rapidly than did any other builder before him or since. He tore through the fabric of old Paris, opening dense, deteriorating spaces with wide avenues that crossed and circumscribed the city. Twenty thousand buildings were destroyed; forty thousand new ones were built. Haussmann displaced tens of thousands of residents, not all of them working class, and set into motion a previously unexercised civic authority. He defined the Paris we know today. In addition to the health and functional benefits of a more open city, and the paths he provided for the métro that was to follow below, Haussmann made Paris monumental. Boulevards become stages: seating was provided by the café that flourished along side them, and their extensive landscaping brought greenery to a city desperately locking in open space. The creation of the boulevard redefined the meaning of the promenade. Most dramatically, Haussmann's plans set historic and new landmarks center stage at the end of boulevards, defining vistas that are so familiar today: Avenue de l'Opéra terminates at Garnier's baroque masterpiece; Boulevard de Sébastopol at the Gare de l'Est; the Rue de Rivoli at the Place de la Concorde. The boulevards became a focus for the Impressionists: Monet's series of the Boulevard des Capucines (1870s) and Pissarro's study of the Avenue des Italiens (1897). Perhaps the most familiar image of Haussmann's Paris is Caillebotte's Rainy Day (1877), depicting a scene along the Place de l'Europe. To find older Paris you have to venture away from the boulevards and landmarks. Even the city's original settlement--Ile de la Cité--is not completely historic. Haussmann razed most of the island, leaving the impression that it was always a place of civic structures and suggesting that the architects of Notre-Dame built the cathedral around a large square. In fact, the Gothic masterpiece stood for most of its existence surrounded by a dense cluster of small buildings. Older Paris can be found in parts of the Marais, Belleville, and the Latin Quarter, where the streets--and many of the buildings--are not very straight. In these places you feel as if you've wandered into another time: veinlike cracks run through chipped masonry walls that expose the unevenly baked bricks from past centuries; open passageways connect a network of courtyards and old winding wooden staircases. Signs have accumulated documenting type styles and regulations of different times. The same iron lampposts, cast over a century ago, continue to illuminate the night. Streets and alleys are mosaics of cobblestones, washed shiny along the curbs by the constant flow of water. Such neighborhoods were often judged by planners of this century to be unhealthy places and inefficient uses of land. Tuberculosis was prevalent, and around the turn of the century, many of these districts were designated îlots salubres--urban renewal areas. Subsequently, parts of outlying areas in Place d'Italie-Gobelins, Montparnasse, Belleville, and Ménilmontant were razed. Old buildings were replaced with a variety of apartment houses and public buildings that range in character from bland slabs, which broke up the former street system, to low- and mid-rise postmodern forms that sought to fit in with what was left. Architecturally, however, even the most attractive of these projects have little to do with their neighborhoods or, for that matter, with the city in which they rise. But their extensive presence is defining a new look for the city. The historic fabric of the inner city, too, has been cut up. The first designated îlots salubre is where the Pompidou Center now stands. Nearby, Les Halles was formerly the site of the city's wholesale food market. Its glass and metal pavilions were architecturally innovative when built in the 1860s. But even before the First World War, Les Halles' function was no longer considered appropriate in the neighborhood of the Hôtel de Ville and the Louvre. The recent rebuilding of Les Halles exploits its central location. Below grade, a major rail complex was created by linking the local and regional mass transit lines that cross underneath the site. This development helped support the modern commercial and residential complex that was built above. Large-scale planning continues to reshape the city. Doing so most visibly are the Grands Projets that are meant to rejuvenate the eastern part of the capital. La Villette is a constructivist-style cultural center symbolizing France's commitment to science and technology. The Grand Louvre involves the reorganization and modernization of a tremendous space. In a new development area just outside the city's western limits, a new arch--La Tête Défense--is a reference to both tradition and the future. It reinforces the city's main arterial axis visually and highlights Paris' commitment to being a major corporate headquarters without the destruction of any part of the city itself. La Défense's large monolithic skyscrapers, however, reflect the overall quality of modern architecture in Paris, which pales even in comparison to the skyscrapers that were rising in New York in the 1950s and 1960s. The response to the new Institut du Monde Arabe, located on the Seine's Left Bank at the entrance to the Boulevard Saint-Germain, has been extremely positive. But the building, with its sheer glass curtain wall design, is in the wrong place. The Institut's sleek, transparent finish breaks up the aesthetic continuity of an historic area whose splendor is based on the ensemble of related architecture. Nearly all of the eight Grands Projets are publicly oriented and are meant to define new places. They represent the most significant government undertaking since Haussmann's time. But there is a basic difference in the design principles of the two programs. Whereas Haussmann's approach expressed concern for linear continuity, Mitterrand's projects are more interested in punctuated focus. While public planning has greatly affected the configuration of Paris, private developers have built most of the city. For centuries their work has been shaped by municipal building codes. Haussmann strictly regulated building heights, setbacks, roof angles, and facade embellishment. The effect remains clearly evident in the architectural uniformity of the city's boulevards. By 1902, greater architectural freedom and diversity was encouraged by a change in the building code that permitted enhanced facade treatment. Buildings no longer had to be aligned, and height limits were increased. These changes accommodated Art Nouveau styling, while sometimes encouraging top-heavy architecture. The code was revised significantly in 1961 in a way that compared with the new zoning rules New York was adopting around the same time. The revisions shaped Paris's 1967 master plan, which encouraged tower and plaza development on large sites where building height was no longer determined by street width but by the size of the lot. Building alignment was deemphasized, and more flexible setback rules were enacted. Intending to change parts of the city, the master plan envisioned that "one will no longer go about between parallel walls, the streets, but in spaces alternating with building and greenery." Along narrower streets, building height remained a function of street width, a measurement that included the distance between the curb and the building. But according to the new rules, if a structure was set back on the ground floor behind the street's common building line, the new greater street width would allow the building to rise higher than others. Another intention of the 1967 plan was to open up and decentralize the city. One way this was to be encouraged was through the creation of commercial zones around the city's railroad stations. It was thought that new office development around the stations, like that which has risen around the Gare de Lyon and the Gare Montparnasse, would encourage people to move to the suburbs and commute into the city. Norma Evenson wrote in Paris: A Century of Change that the 1961 code resulted in "an increase in new building which not only ruptured the existing urban fabric in terms of height, but which also destroyed the existing street alignment." The same could be said about the plans to aerate New York City through the creation of streetside open spaces. In both cities, this new approach to urban form failed to recognize the value of maintaining the unique appearance of different neighborhoods. Both sets of regulations were subsequently altered. By 1974 municipal planning focused on the preservation of the streetscape. While office construction in the center of town was discouraged, residential building was encouraged in order to bring round-the-clock activity to the streets. Guidelines for how much of its lot a building could occupy were based on each district's character. In this way, contextual design, involving the alignment of facades along the street and cornice, was fostered. Lower building heights were set in a number of districts, preserving the existing scale of two-thirds of the city. The code also set out to protect important views, architectural perspectives, and areas surrounding monuments. The idea of preservation is not new to Paris. In 1913, a national law established the principle of compensation for privately owned landmarks. In 1919 and 1924, preservation zones were created around historic monuments. And in 1962, when New Yorkers were also awakening to the need for an official landmark commission, Paris began designating historic districts. The first of these was the Marais, which remains the largest such district ever established. The city's most recent commitment to preservation involved a Grand Projet: the conversion of the Gate d'Orsay into the Musée d'Orsay, a museum of nineteenth-century art. Though concern for preservation is increasing, over one-quarter of the city has been completely rebuilt since 1954. The most troublesome aspect of this statistic is not the change itself. Paris has always been changing. The more significant design issue continues to be the same one that has been affecting cities around the world for the past 40 years. It involves the way basic issues of building are being approached: the desire for originality that speaks of progress and not of the past, the application of minimalistic and abstract design, the search for efficient construction and building operation--the effects of modernism. A permanent exhibition at the Planning Authority in Paris celebrates a current architectural movement that is reestablishing the traditional hierarchy of urban space and neighborhood. While some new projects show a sensitivity to adjacent street lines, height, fenestration, and materials, their facades look like programmed responses to existing structures without an understanding of the spirit of building that used to make architecture French. Sometimes new design is hard to appreciate. Sacré Coeur, the Eiffel Tower, and, even more recently, the Pompidou Center have all become symbols of the city that critics at first claimed they had scarred. On a larger scale, Art Nouveau appeared to many a ludicrous denigration of the city's classical traditions. Half a century later, the style seems to us playful, its sinuous lines a visual relief to the miles of identical architecture lining Haussmann's boulevards. But it was because Art Nouveau combined an appreciation of existing design with the spirit of a new century that it fit in so well. 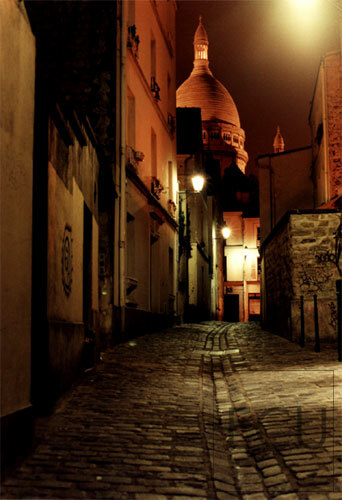 The traditional image of Paris will always be found around Cité and Saint-Louis, Saint-Michel, and the Tuileries. But the city will continue to change in many other places. It is encouraging to see the construction of more artful buildings: Ricardo Bofill's neoclassical Les Colonnes [though its configuration of huge classical columns have absolutely nothing to do with Paris, much less the neighborhood where it sits in Montparnasse], the vast residential complexes in the 15th arrondissement near the Pont Mirabeau and in the 20th arrondissement around the new Parc de Belleville. Perhaps, though, what's unfortunate is that these buildings can be found in other cities too. ERIC UHLFELDER is writing an architectural monograph for Hardy Holzman Pfeiffer Associates and is preparing a book on the design of contemporary Paris. *"The Last Time I saw Paris," Metropolis Magazine, May 1989.